This, to some extent, explains his reluctance to accept a new law that will sit uncomfortably with the right wing of his party and will test its relatively good relations with institutions like the army and the church. Both of these bodies currently enjoy an impunity that some fear would be compromised by the new law. The thinking goes that priests could be sued for ranting at other religions or ethnicities, as happens occasionally, while soldiers could find themselves dragged before courts for nationalistic chants. 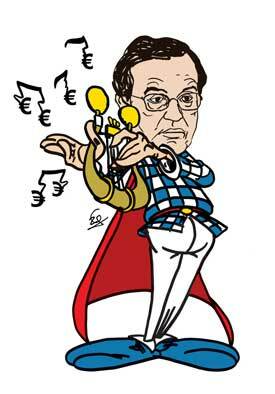 However, there is a less ideological and more practical concern for Samaras as well. European Parliament elections next May are going to be a litmus test for his premiership and his government’s prospects. Greeks traditionally vote a little more unpredictably in these ballots and there is genuine worry within the coalition that all three of the parties – New Democracy, PASOK and Democratic Left (DIMAR) – could suffer considerable blows. A surge for far-right Golden Dawn is of particular concern to government officials. One of the ideas being considered is to hold local elections at the same time as the euro ballot to concentrate voters’ minds and limit defections. In either case, a poor showing for ND and its partners in May could leave the coalition somewhat of a limp duck, stumbling toward general elections with an emboldened opposition constantly reminding it that its devotion to the EU-IMF program does not have popular support. In this rather fragile environment, there is little chance of Samaras taking chances with the sensitivities of the right. He cannot be seen to be giving ground to a bill drawn up by the DIMAR-appointed Justice Minister Antonis Roupakiotis. Equally, stepping back from the xenophobic, rabble-rousing language he has used about migrants, such as calling for city centers to be “reclaimed” during last summer’s election campaign, is also not an option. After all, his was the government that moved with lightning speed – like it has for nothing else – to repeal the law granting second-generation migrants Greek citizenship when the Council of State ruled it was unconstitutional. Samaras seems to believe that the more profitable strategy is to wait for Greece’s economic situation to improve in the hope that this will bring voters back to ND from Golden Dawn, Independent Greeks and elsewhere rather than to back the anti-racism law now in an effort to disperse the far right and strengthen the bond with his coalition partners. Perhaps the Iron Lady would not have been that impressed after all. One of the reasons she despised consensus was because she viewed it as “the process of avoiding the very issues that have to be solved, merely because you cannot get agreement on the way ahead.” It seems failing to reach a compromise can have exactly the same results. This entry was posted in Greece, Greek politics and tagged Anti-racism bill, Antonis Samaras, Democratic Left, Golden Dawn, Greece, Greek coalition, Greek politics, New Democracy, PASOK, Racism. Bookmark the permalink.